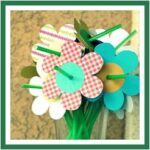 Welcome to Spring Get Crafty! 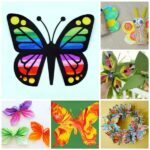 Many of us are slowly sighing a sigh of relief, as the winter days begin to draw longer again, the temperatures warm up and the sun sends us its much needed sunshine kisses… Spring Get Crafty is full of flowers, sunshine, birds and butterflies and lovely green things growing. Aaaah. 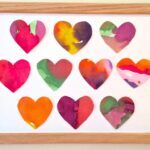 This month we are full of wonderful kids Spring Crafts – but there are some adult ones too – so do scroll down and check them out. So come and take a peak, be inspired and GET CRAFTY! As always, do show the crafters that inspire you, your appreciation and click through! Been featured? Grab a button. Want to be featured? Here is the schedule and “how to” get involved next time! This post is actually all about painting some lovely plant pots in time for new spring plants, but the post ends with this cute little guy, that I couldn’t help sharing him with you… isn’t spring all about growing things?! 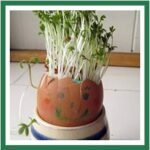 Do visit Nimble Fingers and Steady Eyebrows to see the fabulous plant pots too! Aaaah lovely birds!! 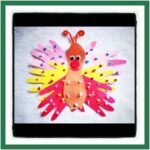 Originally these birds where crafted over a the wonderful Lilla A Design when the birds were migrating “away”… but I think it is such a cute craft it can equally be used to welcome Spring and the returning flocks! Hooray for Spring birds! Lilla A Design also has the cutest “carnivals” imaginable – every so often (I wish I could figure out when) she puts a call our for a topic – in this case Bird Houses, collates all the wonderful relating posts and makes these beautiful craft collages incorporating everyone’s work! Gorgeous. Lovely. Must see! Whilst on the topic of Spring birds… here is a lovely little craft looking at all the Spring Animals… (and erm, Dinosaurs). 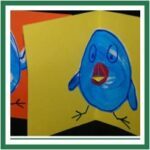 The kids at Frugal Family made these lovely Spring books. I think any book making craft is wonderful for children – it stimulates the imagination, encourages writing skills and is a real sense of achievement when it is all finish. Wonderful! 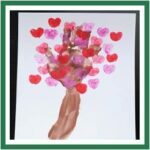 This is indeed the “loveliest” blossom tree around – made from thumbprints, hand prints and hearts. It is just too cute!! I love it and it really made me smile when I first saw it! Visit Meet The Dubiens for more on this craft, as well as lots fab crafts. 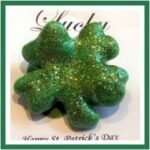 Aaaah, another lovely craft – look at th swonderfully sparkly and lovely Clover for St Patrick’s Day. Doesn’t it look great? Not only does it celebrate St Patrick’s Day, but it is certainly a symbol of all things green and Spring! Visit Little Wonder Days too see how they made it! No reason why you can’t make these to wish someone good luck! And here is another craft that made me go aaah, especially as I had forgotten all about St Patrick’s Day (above) and St David’s Day. Wonderful to celebrate the different traditions. 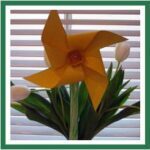 And there is nothing quite so Welsh and Spring like as a Daffodil (although a leak does spring to mind.. mmh). Anyway, I love the cheeriness of this lovely pinwheel.Perfect. Visit Nurture Store for more. I love recycling. And I love getting kids stuck in. Here we have a perfect combo of bringing together nature, Spring AND recycling – a simple conversion of waste into something fabulously useful! Visit Family Fun for more info. Now, where I can I get some clear plastic bottles from? Mmmh. 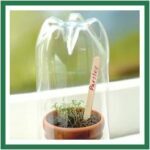 If you have made your glass house, then make sure you keep the 2nd half of your bottle and make this hanging Seedling Pot! How perfect is that? Both ends get used brilliantly! This time however visit Mama To 4 Blessings for more! The simplest crafts are often the best. 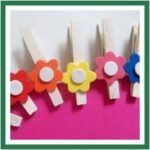 These little pegs are so simple, so cute, so pretty. Great for little hands to help. 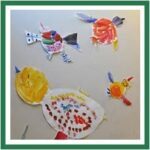 Visit Bird Crafts to see how they Got Crafty. Well you know I LOVE all things made from Loo Rolls. 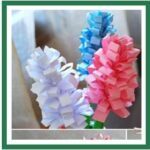 Loo Roll crafts are inexpensive, versatile and fun. Here is another example like that – Binoculars! And aren’t these made wonderfully! Of course you can bird watch all year round… and the bare winter trees probably allow for good line of site.. but isn’t Spring simply more exciting? Things are happening and there is so much to explore! Visit Crafts by Amanda and make some yourself. Oh these butterflies from Sun Hats & Wellie Boots are just too adorable. 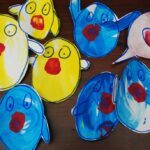 They are also quick and easy to make – perfect for our playgroup next week. Lovely indeed. Red Ted wanted to make some straight away and was very disappointed that he had to wait! Another lovely idea from Sun Hats & Wellie Boots (I really am a fan, if you haven’t visited them before, you must now). These are lovely for a bit of painting, cutting and beading. Great set of skills to practice and the result is gorgeous! Rebecca’s blog is also a new recent find that I adore – she takes amazingly beautiful photographs every week – sharing tips and ideas. And she also gets crafty with her three children. Here they made this lovely flower garland. Hang it up or wear it! Lucky for us the Imagination Tree also remembered St David’s day and that daffodils are always a sure sign that Spring is on it’s way. 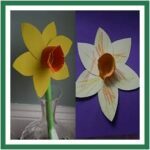 Here are two cute little flower crafts to make with your children! I love the use of an egg carton in the right hand one! If I ever make an ebook on crafting with straws, these would have to be in it. I think they are so cute. 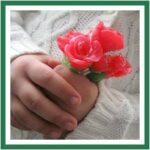 The bouquet looks fantastic and little hands can help. Only thing is… Red Ted would love to actually use the flower as a straw – I guess they would make for great party decor?!?! Check out Create Celebrate & Explore for more. 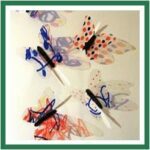 And here is a cute little keepsake made over at Meme Tales – hand print butterfly. How fun and lovely is he? Spring wouldn’t be the same without this little guy! 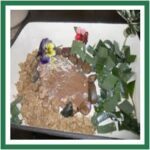 Becky at Baby Budgeting makes an oh so cute Spring Garden. Lovely to explore what spring means to you and your children. When finished, you could always add some toy dinosaurs or animals and have a good play! Am sure if Rainbows strictly speaking = Spring, but this is my Get Crafty and I like “loose” interpretations! I really loved these cute sorting dolls. I know Pip Squeak would adore these… So again, I had to sneak them in! 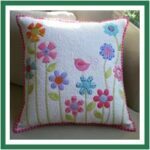 Visit Brandy’s Crafts and see how she made them! 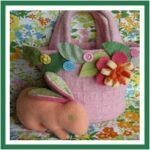 I love the fact that this cute little bag is made from a “recycled jumper” – so get your old woolly jumpers out, wash them too hot in the machine to “felt them” and make this gorgeous little bag – a perfect Easter gift! Betz White gives us more info. 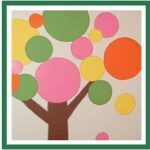 This is a lovely bright and cheery tree! It looks fabulous and The Polka Dot Umbrella mummy lovingly painted this on her daughter’s bedroom wall.. Love the final detail of adding “stitches” to complete the picture. One Red Ted Art’s crafty little “How To”s. 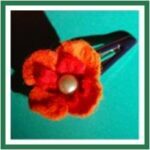 See how easy these “No Sew Felt Flowers” are.. make hairslides or brooches or other accessories. They look lovely and they are easy! The arrival of birds is indeed a sign of Spring for me. 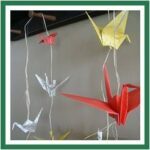 And if you ever thought of giving oragami a try and learning this oh so classic and traditional crane, now is the time! 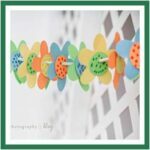 The look lovely hanging in your Easter décor or just to brighten up your house for Spring! I like how these are made out of any sort of paper including old book pages! Lemon Tree Creations came up with this wonderful print technique to ake your own wonderful fabrics. They really do look great and look easier than you think. Come and visit and find out more. Now, I have only just embraced machine sewing and see myself very much a beginner. If you are a bit more experiences and want a challenge, come and visit Don’t Look Now and follow this pretty tutorial. Aaaah. Yet another simple craft. I think these candles look so fresh. I know that we usually associate candles, with Autumn and Winter, but these just caught my eye… they looked lovely and Spring like. Good old Martha Steward shows us how. We recently received a lovely gift of a “bulb in a vase” – in turned into a lovely Hyacinth and Red Ted watched with fascination as the leaves came out and then “Oh!! !” the flower.. it really was quite spectacular how it appeared “overnight”. If you don’t have the space or time or inclination for “real ones”, these are very neat! Visit Kpotokat and see how these are made. Aren’t these simply too pretty? I just love them. They look so fresh and beautiful and delicate all at once. Made from crepe paper these will last you for quite some time! 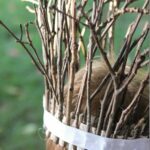 The DIY Wedding shows us how! 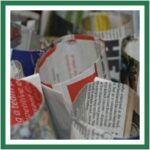 These paper rosettes were quick to make and were made from “recycled” materials. Perfect. I love how over at the Make The Best of What’s Around, they then stuck these on to branches – make them look oh so blossom like and sweet! I like! This is a wide spread “craft” amongst gardeners worldwide! 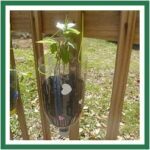 Take a simple paper and turn it into seedling pots. Watch the How To video and make your own! 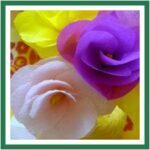 Now these sugared roses look rather special… but you know, they are MUCH easier to make than you think.. Craft Berry Bush shows us these really easy and clever “how to”. Aaah what cute little cupcakes.. love how happy and cheery they are. A perfect way to celebrate Spring around the corner. Lovely lovely. Visit Skip to My Lou and follow their instructions! As we have already established, Rainbows rock. 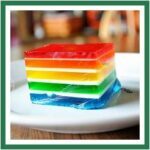 And this Rainbow Jelly is rather impressive. WOW! WOW! WOW! Visit the Funky Polka Dot Giraffe for more. 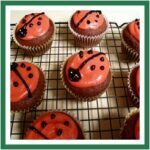 Ok. For some reason, this lovely blog didn’t share their recipe… however, I thought these ladybird cupcakes were very cute – surely “all” you need to do,a re make some choc muffins, purree some raspberries with icing & butter and add some melted chocolate for the spots and “black” bits? Bobs yourdelicious uncle? 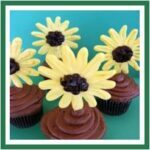 Check out the Cupcake Takes The Cake blog. Smallable has a range of products on offer – from stylish children’s clothes, to children’s furniture, to contemporary jewellery and gorgeous toys. It is difficult to just pick out a few items to share with you. The clothes are truly amazing and the toys are even better. As a crafty such and such I am drawn to the creative toys. My are they nice. One lovelier than the next – so which to pick and tell you about? Aargh. 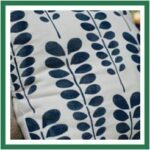 You simply must visit Smallable and take a look too! Make up your own mind about what you like! The website is also set up in a way that helps you navigate easily – as well as making outfit recommendations to get that perfect look! Firstly: visit their brand new Spring Summer Magazine for the latest fashion. Dwell Studio Zoo: Remember our Ink Stamp post? Wasn’t that something? 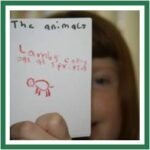 Well if you are feeling all inspired by the Ink Stamps, check out these gorgeous “Zoo Stamps”. I love the trees and the grass – so simple and clean and pretty and prefect for Spring. Pop over to Smallable and see what other stamps they have! Go see what other wonderful creative games Smallable has. Noted Plane Mode: If stamps are not your thing, check out these wonderful and traditional little propelled planes. I am pretty certain I had some of these when I was small.. Hoverever not quite as stunningly designed. They look fabulous! For more info visit the Noted Plane Model here. 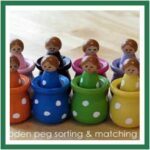 Petite Red Dog – when it comes to toys, I love quirky and different and certainly toys that others don’t have. To me this lovely little dog is just that! He is absolutely lovable without being run of the mill! Do check out the rest of the Dolls and Plush Toys, I am SURE you will find someone to take home with you! The Little Collection Soldiers Frieze is another example of the different types of stylish and contemporary products available at Smallable. I know that Red Ted would LOVE this Frieze – especially after we visited Buckingham Palace and he was rather taken by the soldiers there! I love love love the “look” of Smallable’s children’s clothes and am so excited about their brand new Spring Summer catalogue coming out later today (be sure to be back to check updated links) – you will find wonderful new looks and décor ideas. And Smallable have a wonderful offer for you, Red Ted Art readers: spend 50€ + and get 10€ off – all you need to do is enter the code REDTEDART*. (*Valid until 31 March 2011. Codes may not be combined with other offers and promotions). Seen enough? No? Go and visit Smallable now! Get Crafty – Aug 2010 – SUMMER! Get Crafty – July 2010 – Made by Man! It is a pleasure Catherine! 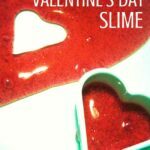 Love your crafts and love your blog!! 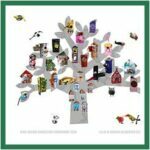 Thank-you so much for including my love blossom tree Maggy! 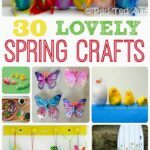 Great craft ideas!! Love this list! Yeah great Spring ideas to check out.. Thanks again for playing along.. Have an amazing weekend..
Wow…alot of cute and great ideas! I saved a few to look at later. Thanks for sharing the links. 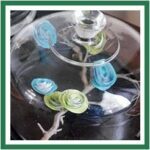 awesome crafting ideas, what a delight to look and learn. Thanks for this wonderful, inspiring collection of ideas. 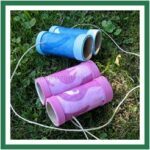 My girls have Spring Break next week, and we need projects to keep them happy! These are great. Aaah so fab you guys like the ideas! Do you hope you get a chance to have a go 🙂 Happy Spring!